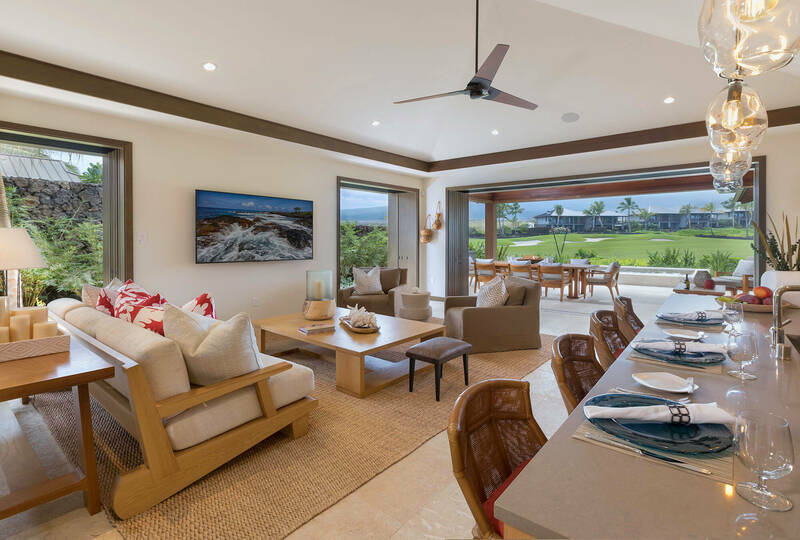 The `Alani Residences are a collection of single-family and paired homes located between the 7th and 8th holes of the members-only golf course. Khoi Le, of Glazer Le Architects, was inspired by both the natural beauty of the Hawaiian Islands and topography of the land when designing these homes. The result of this inspiration is a home that is unique on the Big Island in terms of style and design sensibility. On the exterior, the homes feature distinctive copper roofs and western red cedar or stucco walls. Inside, the homes have spacious bedrooms and guest suites connecting to an open-concept great room and kitchen space. Sliding mahogany doors open the interior living space to the lānai and private yard creating a seamless indoor/outdoor living space.